نیک‌‌بخش, محمد رسول, مشین چی اصل, میرستار. (773). تعیین عمق و نیم‌پهنای صفحه شیب‌دار از پتانسیل خودزا با استفاده از روش میانگین متحرک ثانویه با کاربرد منحنی‌های پنجره‌ای. مجله ژئوفیزیک ایران, 5(2), 86-96. محمد رسول نیک‌‌بخش; میرستار مشین چی اصل. "تعیین عمق و نیم‌پهنای صفحه شیب‌دار از پتانسیل خودزا با استفاده از روش میانگین متحرک ثانویه با کاربرد منحنی‌های پنجره‌ای". مجله ژئوفیزیک ایران, 5, 2, 773, 86-96. نیک‌‌بخش, محمد رسول, مشین چی اصل, میرستار. (773). 'تعیین عمق و نیم‌پهنای صفحه شیب‌دار از پتانسیل خودزا با استفاده از روش میانگین متحرک ثانویه با کاربرد منحنی‌های پنجره‌ای', مجله ژئوفیزیک ایران, 5(2), pp. 86-96. نیک‌‌بخش, محمد رسول, مشین چی اصل, میرستار. تعیین عمق و نیم‌پهنای صفحه شیب‌دار از پتانسیل خودزا با استفاده از روش میانگین متحرک ثانویه با کاربرد منحنی‌های پنجره‌ای. 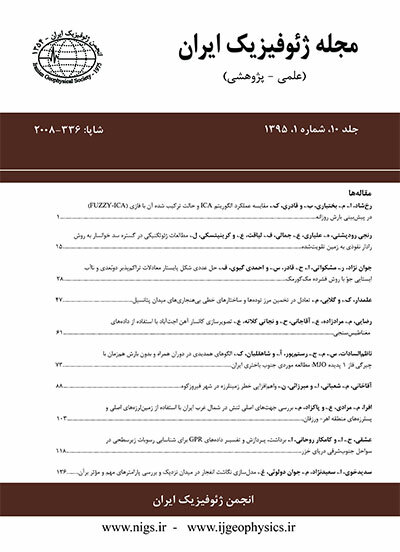 مجله ژئوفیزیک ایران, 773; 5(2): 86-96. در تحقیق حاضر، روش جدیدی برای برآورد عمق و نیم‌‌پهنای صفحه شیب‌دار درحکم یک بی‌هنجاری دوبُعدی پتانسیل خودزا پیشنهاد می‌‌شود. دراین روش که به روش میانگین متحرک ثانویه (second moving average method) معروف است، برای طول پنجره‌‌های متوالی با استفاده از منحنی‌‌های پنجره‌‌ای (window curves) عمق و نیم‌‌پهنای صفحه شیب‌دار دوبُعدی محاسبه می‌‌شود . برای هر طول پنجره ثابت به ازای هر نیم‌پهنای فرض شده معادله غیر خطی به‌دست آمده ، به روش تکرار نیوتن به‌منظور محاسبه عمق حل می‌‌شود . با رسم عمق‌‌های محاسبه شده برحسب بازه نیم‌پهنای فرض شده که به منحنی‌‌های پنجره‌‌ای معروف هستند، می‌توان عمق و نیم‌پهنای صفحه شیب‌دار از محل تقاطع این منحنی‌‌ها را به‌دست آورد. در تحقیق حاضر این روش برای یک مدل با عمق‌های متفاوت و نیم‌پهنای یکسان برای داده‌های مصنوعی بدون نوفه ونوفه‌ای مورد بررسی قرار گرفته است. نتایج به‌دست آمده روشن ساخت که این روش برای داده‌های بدون نوفه بسیار دقیق است و برای داده‌های نوفه‌ای خطای کمتر از 3 درصد دارد. Self-potential (SP) prospecting is one of the oldest geoelectrical methods, and it is still used in many fields of applied geophysics. The SP measurements refer to that part of the natural electric field which is stationary in time, or nearly so, and whose current source system is generated and sustained by phenomena occurring underground within geological structures. From the physical point of view, the common aspect of the many source models is an electrical charge polarization is setup, which is responsible for electrical current circulation in conductive rocks. Hence, the detected SP anomalies are simply the surface evidence of a more or less steady state of electrical polarization (Abdelrahman et al., 1999). The two-dimensional inclined sheet model can be useful in quantitative interpretation of SP data measured in a small area over a buried structure. Estimating the depth upper edges and the dip of a two-dimensional inclined sheet from self-potential anomalies measured perpendicular to the strike of the structures has drawn considerable attention. The advantages of the fixed geometrical methods over the 2-D and 3-D continuous modeling are that they require no current density, and the resistivity and rough estimation on depth and the interpretation of isolated SP anomalies is fast and accurate. Many of the geological structures in mineral exploration can be classified into four categories: spheres, vertical cylinders, horizontal cylinders and inclined sheets. These four simple geometric forms are convenient approximations of common geological structures often encountered in the interpretation of SP data. The models may not be entirely geologically realistic, but the approximate equivalence is usually sufficient to determine whether the form and magnitude of calculated SP effects are close enough to those observed to make the geologic interpretation reasonable. Evaluation of the depth and the width of a 2D plate from self-potential (SP) anomalies measured perpendicular to the strike of the structure has attracted considerable attention. Several methods have been proposed and discussed by many researchers to interpret the self-potential anomalies caused by 2D inclined plates, including, for example, logarithmic curve matching (Murthy and Haricharan, 1985) and the analysis in the frequency domain using the Fourier transform (Rao et al.,1982). In this paper, a new method has been developed to estimate the depth and the half-width of a 2D inclined plate with a self-potential anomaly. This method is the second- moving average for successive window lengths to determine the depth and half-width of two-dimensional inclined plate. For a fixed window length, the depth is determined iteratively using the solution of a nonlinear equation with the iterative Newton Raphson method for each half-width value (Stanley, 1977). The computed depths are plotted against the half-width values representing a continuous window curve. This method can be used for two model and synthetic data with and without random noise. After adding 10% random error in the synthetic data, the maximum error in model parameters is less than 3%. The problem of determining the plate parameters from self-potential data of short profile length can be solved using the second-moving average method. The method of window curves has been extended using the second-moving average self-potential anomaly to determine the depth and half-width of an inclined plate.